saute all the ingredients and cook for 8 minutes only. 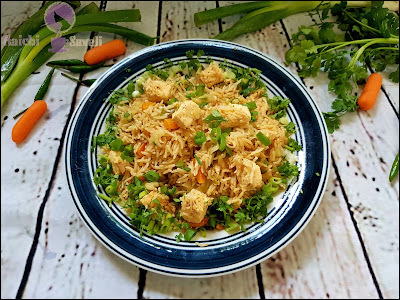 This recipe of paneer fried rice is similar to the preparation of veg fried rice, and this is mildly spicy, so kids friendly and goes well with tiffin box. 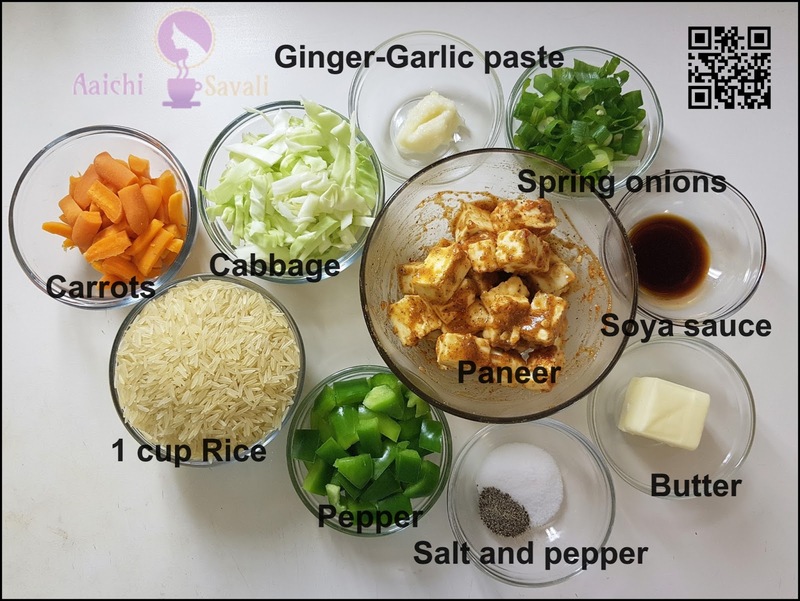 Paneer fried rice made with basmati rice, paneer (cottage cheese) and vegetables, flavored with soy sauce, that's how I have made this Indian meal with a Chinese twist. This vegetarian recipe is served as the main course and is cooked as one pot recipe. 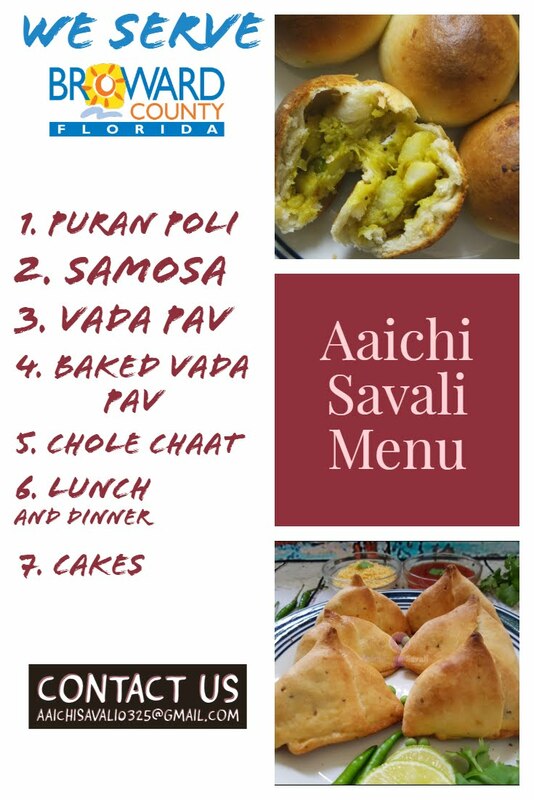 You can accompany it with gravy Manchurian or raita. Total Time : 20 Minutes. Each serving carries 316 cal. In a bowl add tomato sauce, red chilli sauce, cornflour, soya sauce, black pepper, salt and mix all well. Now, add paneer to this mixture, coat well and keep aside. Wash rice under tap water until clear and soak rice in water for about 30 minutes. Turn on instant pot to saute mode and add 2 tbsp of butter / veg oil, then add ginger garlic paste and green chillies, saute well and add chopped carrots, cabbage, capsicum mix and saute all very well. 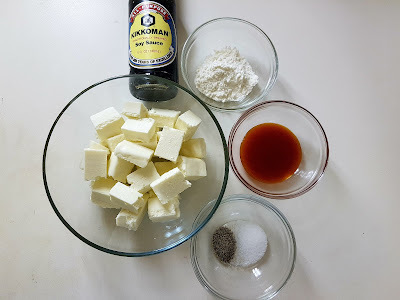 Now, add soya sauce, black pepper, salt, and marinated paneer, cook till paneer cooks well. Add soaked to the Instant Pot and toast for a minute and keep stirring continuously. Add 1 ½ cup of water and mix all well. Close Instant Pot with the pressure valve to sealing. Pressure Release Method : 5 minutes natural pressure release. 8) Now open the lid of Instant Pot, sprinkle coriander leaves or spring onions. 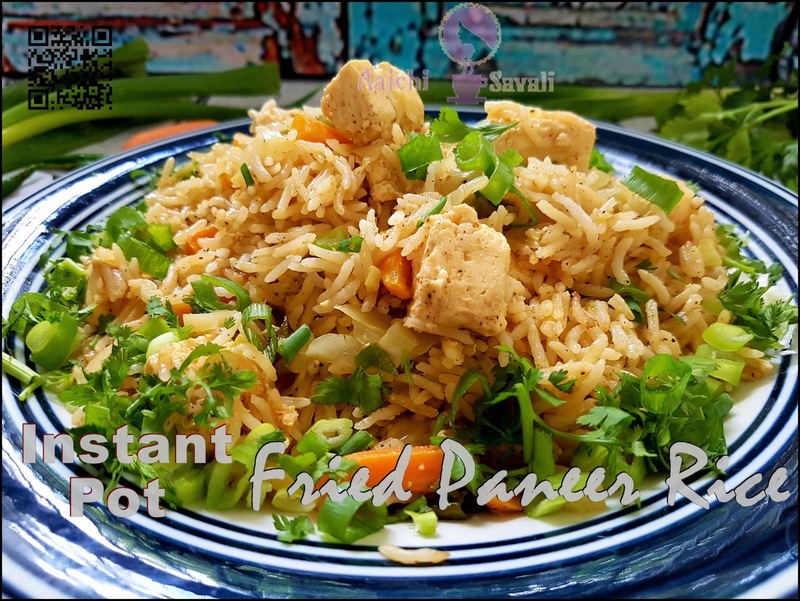 9) Here, delightful, mouthwatering and instant Paneer Fried Rice is ready to serve. Enjoy!!! Per serving contains 316 calories, along with carbohydrates - 42.2 g, fats - 8.93 g, proteins - 10.05 g.
Rice is gluten free food, which makes it one of the best non-allergic foods. Rice contains Vitamin B, D, calcium, fiber, iron, and a variety of minerals that are essential for our bodies. Heart : Bran oil made from rice contains powerful antioxidants that can aid in making our heart more resistant to heart-related diseases. Rice also helps to lower cholesterol levels, as it does not contain bad cholesterol, making your heart even healthier. Rice contains a lot of carbohydrates that give our bodies the energy we need. It is safe to say that rice is also good for maintaining or reaching your ideal body weight. 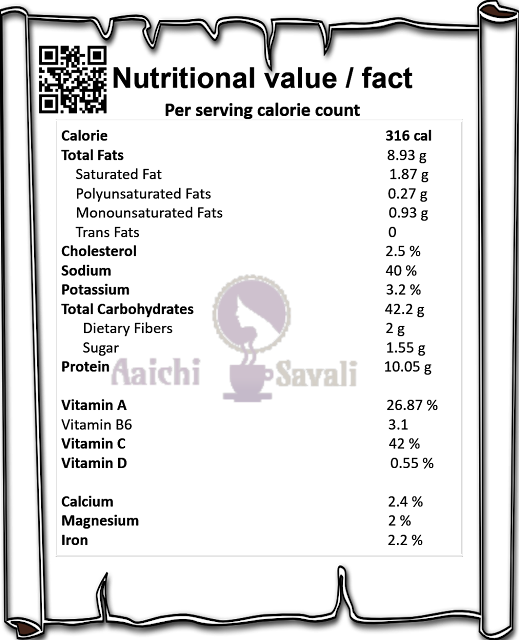 Rice is the perfect food to help you with this, so you should include it in your well-balanced diet without any doubts. In 100 g of paneer, you can receive 18g of protein. For vegetarians who do not eat meat, this is one of the best ways to get enough protein to help build and repair lean muscles. Paneer contains lots of omega-3 and omega-6 fatty acids that help fight with rheumatoid arthritis. Keep hair and skin healthy : The consumption of paneer can give us healthy hair and nails because of its vitamins, protein, omega-6 fatty acid and antioxidants contents. Digestion : Paneer can improve your digestive systems because it can promote the hydrolysis of protein. Paneer is a high protein food having high level of calcium and phosphorus which helps in building strong bones and teeth. 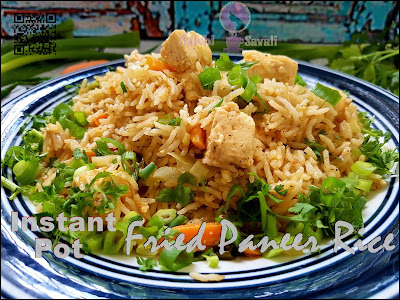 It is good to eat Paneer Fried Rice for lunch or for brunch. lovely ... i love anything paneer. Thank you. I am glad to know that you liked it. Yummy! I want a plate now.. Thank you for such a lovely comment and I am happy to know that you liked it.